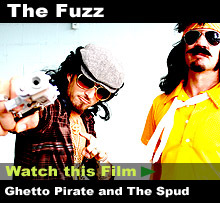 The Spud, Hilarious cartoons, videos, online entertainment. Check out "The Fuzz" and "TheFlea"
Bucker has somehow misplaced his balls. This crazy chicken is up to something. Yo, yo, just hangin in da hood wid da nickels. Need a Zombie for that special person or occasion? Recommend TheSpud.com to your friends. This site is not pornographic, but is intended for adults over the age of 18.